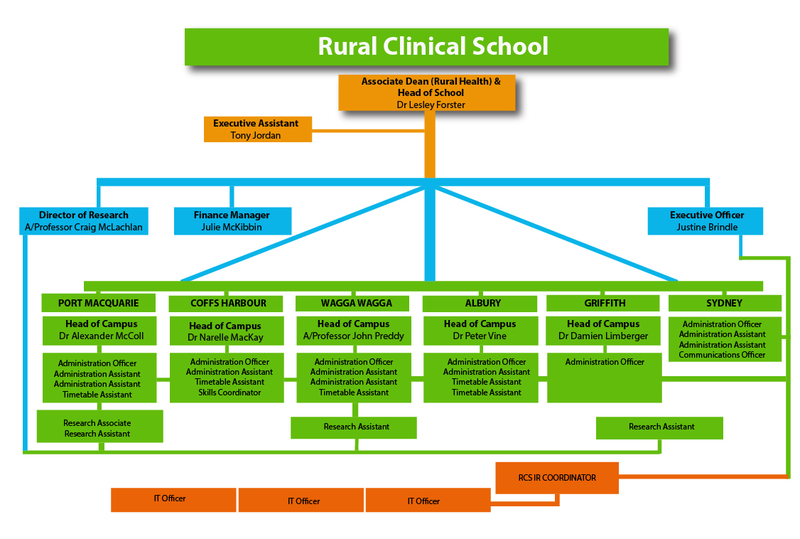 The UNSW Rural Clinical School is an important part of the Faculty of Medicine. The Head of School, who is also Associate Dean Rural Health, is a member of the Faculty Executive and reports to the Dean, Faculty of Medicine. There are six campuses in Albury-Wodonga, Coffs Harbour, Griffith, Port Macquarie, Sydney and Wagga Wagga. There are sub-campuses in Kempsey and Grafton. The School Executive Committee includes the Heads of each campus, School Executive Officer and Head of School. The Heads of Campus are senior local clinicians who are responsible to the Head of School for management of their local programs and staff. The School Executive Officer is responsible for all non-academic operations, including human resource management, industrial relations, finance, and policy management and development. The School has a Community Advisory Board and Community Liaison Committees for each campus providing a forum for communication between the local rural communities and the School. See organisational chart for our school.